Reserve Bank of India data says old notes worth Rs 15.44 lakh crore were there in the market, out of which 15.28 lakh crore have been received by the bank. Most modes of retail electronic payments grew month-on-month in August in volume terms, with the exception of the Unstructured Supplementary Service Data (USSD) channel, which remained flat, according to representative data released by the Reserve Bank of India (RBI). USSD transactions remained unchanged in volume terms at 0.19 million and slipped 2.6 per cent in value terms from the month-ago period to Rs 29.42 crore. This mode of payment is meant for users of feature phones. The Unified Payments Interface (UPI) channel grew the fastest — rising 45 per cent month-on-month (m-o-m) in terms of the aggregate volume of transactions to 16.6 million in August and 22 per cent in value terms to Rs 4,127.2 crore. This brings the average ticket size of a UPI transaction to Rs 2,486, lower than the corresponding figure of R2,966 for July. The increased usage of UPI may have come due to more e-commerce players, such as Uber, joining the platform in August. In July, then managing director and chief executive officer of National Payments Corporation of India (NPCI) AP Hota had said that UPI received a significant boost after it was made available on Flipkart and NPCI was working to on-board Amazon in a bid to further push UPI usage. Wallets and other prepaid payment instruments (PPIs) issued by eight non-banks clocked Rs 2,722.2 crore, up 8.4 per cent from July, on 89.7 million transactions, up 1.1 per cent from the previous month. Based on this, the average ticket size of a wallet transaction works out to about Rs 303, up from Rs 283 in July. The average value of a UPI transaction is typically higher than that of a wallet transaction because use of the former channel has so far been limited to peer-to-peer payments, while wallets are more commonly used to make small-value payments to merchants. Transactions made through debit and credit cards at point-of-sale terminals grew 2.2 per cent in volume terms from July to 243 million. 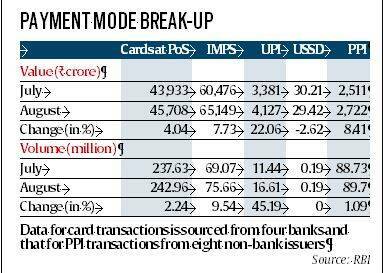 The aggregate value of card transactions, rose over 4 per cent from the previous month to Rs 45,708.11 crore. The value of transactions made through IMPS rose 7.7 per cent month-on-month to Rs 65,149.47 crore, while the volume grew 9.5 per cent to 75.7 million.